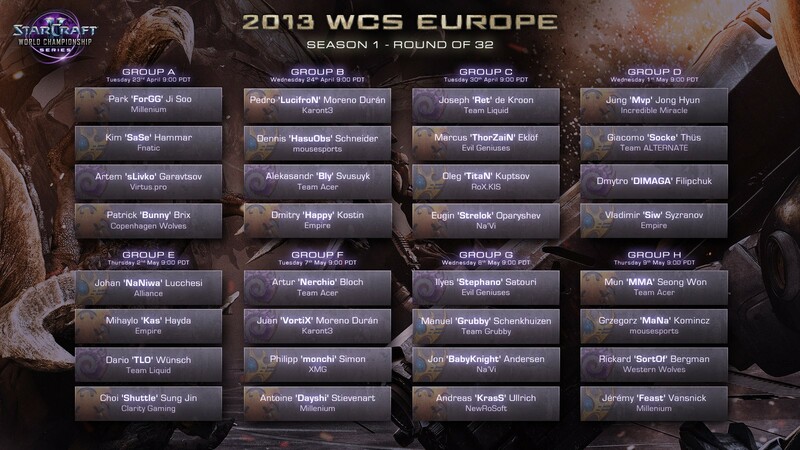 Let the WCS Europe 2013 Premier Group Play…begin! The first season of the WCS Europe 2013 season for Starcraft 2 kicked off last week, and saw thousands of gamers from around the world put their clicking fingers on the line, for a chance at glory. Out of all those players, only eight survived to fill out the final seats of the qualifier stage. Here’s how the rest of the tournament is going down. With 32 players now having qualified for the Premier League, they’ll be split into eight four-player groups for the start of the first Premier League Group Stage of WCS Europe 2013, season 1. Each group will be engaging in five best-of-three matches in the Dual Tournament format, with 16 of the players who win two of their matches in that first round, advancing to group stage deux. As for the other 16 players who don’t meet that criteria and happen to lose two matches, they’ll be relegated down to the Challenger League to compete for a chance at returning to the Premier League. To catch all the action, head on over to the official WCS Europe Twitch.TV stream, with matches starting from 18:00 CET.